The Florida legislature is talking about an issue that UF professors have been concerned about for years — the impact of students dropping classes. For this semester at the University of Florida, the drop date is April 10. That’s the date that students can use a “free drop.” Keep in mind that the last day of classes for the semester is April 22. Every semester, UF students have this option of dropping a course within days of the end of the semester. And if they are on a Bright Futures Scholarship, as most students who begin as UF freshmen are, they aren’t paying for that lost tuition. The legislature has projected that 222,000 credit hours will dropped at state universities and 76,000 credit hours at community colleges during the upcoming year, which amounts to $30 million in tuition. Faculty would agree with her. Every semester, we as faculty discuss how much effort we invest in students who are having difficulty with the course content only to have them drop at the end of the course. Quite a few of those students are earning passing grades, sometimes even Bs or Cs. 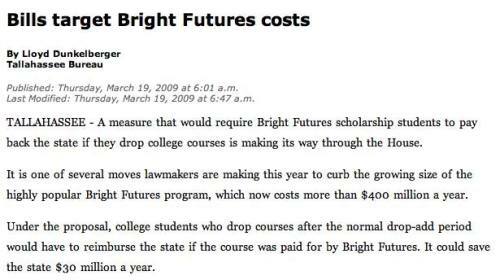 But they don’t want lower grades to hurt their GPA, as they think ahead to applying to grad school or law school. Many of those students could be passing and earning those higher grades if, from the beginning of the course, they knew they had to complete the course. I can tell that they aren’t really engaged in the course and putting full effort into their performance. And if dropping doesn’t include a grade penalty or a financial penalty for the students, they see dropping as an option. Stargel learned about the use of drops by Bright Futures students from her daughter, who is a student at Florida State. In a time when Florida is facing a financial crisis for the overall state budget and universities are being asked to prepare plans for budget cuts of up to 10 percent, the students need to address their part of the budget crisis. About seven percent of all credit hours are dropped. We can’t afford that.